[110 Pages Report] The global silk market is projected to be valued at USD 16.94 billion by 2021, at a CAGR of 7.8% from 2016 to 2021. In this study, 2015 has been considered the base year and 2016 to 2021, the forecast period, to estimate the global market of silk. 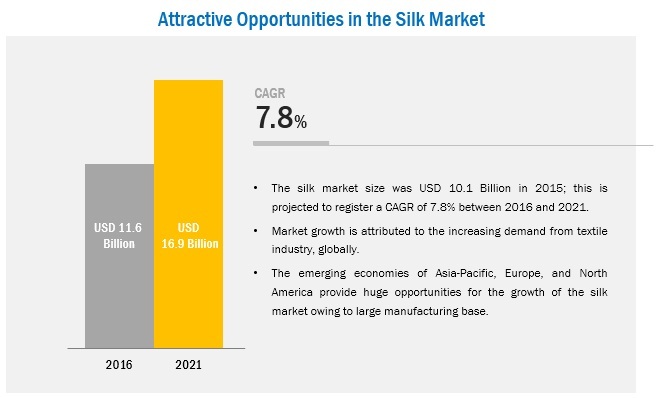 The growing demand in the Asia-Pacific, coupled with the growing demand for textile goods is expected to drive the global silk market during the forecast period. Textile is the fastest-growing application of silk. Silk is an important contributor to the textile industry which is continuously growing and evolving in terms of demand and supply. Silk is used in textiles for its lustrous appearance, luxurious feel, lightweight, resilient, and strength. It is used in many types of apparel such as wedding dresses, gowns, blouses, scarves, neckties as well as in many household products such as pillows, wall hangings, draperies, upholstery. Further, Silk's absorbency makes it quite comfortable to wear, especially, in warm weather. Its low conductivity keeps warm air close to the skin during cold weather. This increases the uses of silk for clothing such as shirts, ties, formal dresses, high fashion clothes, lingerie, pajamas, robes, dress suits, sun dresses, and kimonos. In India, silk is also used for making sarees, which is traditional outfit in the country. During this research study, major players operating in the silk market in various regions have been identified, and their offerings, regional presence, and distribution channels have been analyzed through in-depth discussions. Top-down and bottom-up approaches have been used to determine the overall market size. Sizes of the other individual markets have been estimated using the percentage splits obtained through secondary sources such as Hoovers, Bloomberg BusinessWeek, and Factiva, along with primary respondents. The entire procedure includes the study of the annual and financial reports of the top market players and extensive interviews with industry experts such as CEOs, VPs, directors, and marketing executives for key insights pertaining to the market. 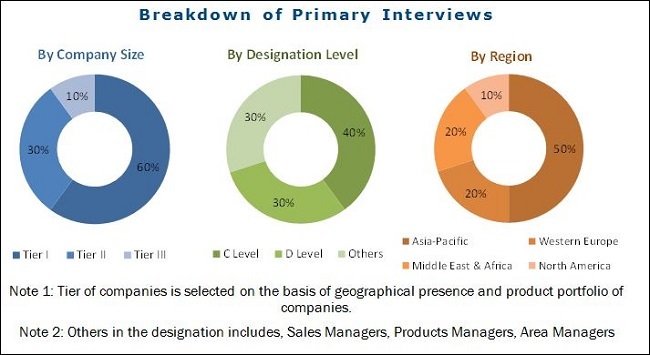 The figure below shows the breakdown of the primary interviews on the basis of the company type, designation, and region considered during the research study. Silk is a consolidated market with Asia-Pacific countries catering to the major share of demand and supply. Globally, China and India are the first and second largest producers of silk respectively. The sericulture industry has a history of over 6,000 years in China. China is also a major exporter of silk in the world. The major type of silk produced in China are mulberry silk and Tussar silk. In March 2017, Bolt Threads Inc. started its first product made of spider silk. It introduced tie made of spider silk. In September 2016 AMSilk GmbH entered into distribution agreements with Korean-based company Hanjoo C&C for the distribution of its product in the Asian market. It distributes AMSilk products, Silkbeads (microparticles), and Silkgel (hydrogel) in Korea. In June 2016, AMSilk GmbH entered into an agreement with Zurich based company, RAHN AG, to distribute two ingredients made from AMSilk, Silkgel, and Silkbeads. What is emerging type of silk being developed? The global silk market is projected to reach USD 16.94 billion by 2021, at a CAGR of 7.8% from 2016 to 2021. Silk is experiencing a high demand from the Asia-Pacific region mainly from China. Asia-Pacific is the largest producer of raw silk which makes it the region with easy availability of raw material. Silk find application majorly in textile industry. Increasing demand from textile industry promoted the usage of silk. Technological development in the sericulture industry is expected to further drive the silk market. The mulberry silk is projected to be the largest type in the silk market from 2016 to 2021. Mulberry silk is majorly used in the textile industry. Mulberry silk is also used in the blends made with other natural fibers such as cotton to enhance the properties of base fiber. Improving quality of silk is expected to increase the demand of mulberry silk and drive the silk market in the future. The tussar silk is the second largest type of silk used after mulberry silk. 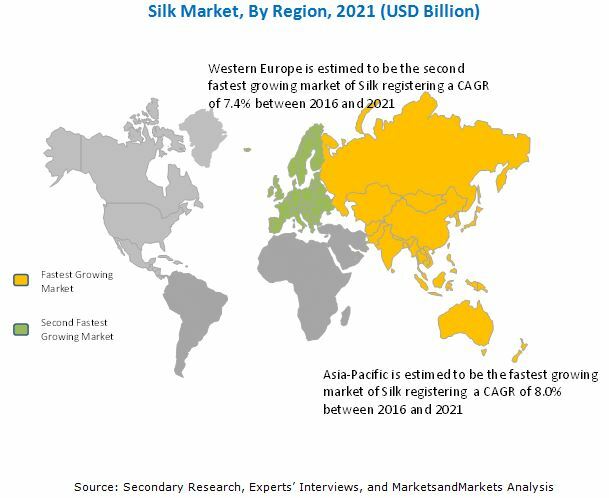 The Asia-Pacific is projected to be the fastest-growing market for silk, in terms of value and volume, during the forecast period. China, India, Uzbekistan, and Thailand are the markets of silk in the Asia-Pacific region. The demand for silk is primarily driven by the increasing population & export of the textile goods made in these countries. Also, the domestic demand of silk in China and India is significantly influencing the demand of silk in the region. Textile is the largest as well as fastest-growing application of silk market. Silk is used in textiles for its lustrous appearance, luxurious feel, lightweight, resilient, and strength. Silk material is used for wedding dresses, gowns, blouses, scarves, neckties as well as in many household products such as pillows, wall hangings, draperies, upholstery. Silk's absorbency makes it quite comfortable to wear, especially, in warm weather. Its low conductivity keeps warm air close to the skin during cold weather. This increases the uses of silk for clothing such as shirts, ties, formal dresses, high fashion clothes, lingerie, pajamas, robes, dress suits, sun dresses, and kimonos. Cosmetics & medicine is the another major application cluster of silk material. This application of silk is still in nascent stage and cater to a very small share of silk market. Silk fibroin is a natural protein which is used as a raw material for various cosmetic products. Silk is used in cosmetic cream, lotion, liquid soap, cleansing foam, shampoo, conditioner, and nail enamel. Silk polypeptide is used in shampoo, skin lotion, skin cream, cleansing cream, and soap owing to its excellent film making function. In medicine application silk-based biomaterials (SBBs) have been used clinically, viz. sutures for centuries. What is spider silk, the emerging type in silk market? The global silk market is witnessing a high growth rate. Factors restraining and challenging the growth of silk market are higher dependency on china for raw material and high cost of material. China is the largest producer and exporter of silk globally, giving them leverage over price setting and product quality. This lowers the switching power of buyers, restraining the market growth in terms of demands. Companies such Anhui silk Co. Ltd. (China), Kraig Biocraft Laboratories, Inc. (U.S.), Wujiang First Textile Co.,Ltd. (China), Wujiang Wanshiyi silk Co., Ltd. (China), and Zhejiang Jiaxin silk Corp., Ltd. (China) are the leading market participants in the global silk market. 10.1 Anhui Silk Co. Ltd.
10.2 Wujiang First Textile Co., Ltd.
10.3 Wujiang Wanshiyi Silk Co. Ltd.
10.4 Zhejiang Jiaxin Silk Co., Ltd.
10.5 Sichuan Nanchong Liuhe (Group) Corp.
10.6 Shengkun Silk Manufacturing Co., Ltd.
10.7 Jiangsu Sutong Cocoon & Silk Co.
10.8 Jinchengjiang Xinxing Cocoon Silk Co., Ltd.
10.9 Wensli Group Co. Ltd.
10.15 Kraig Biocraft Laboratories, Inc.